Signs have been posted around Breckenridge for the new paid parking program. 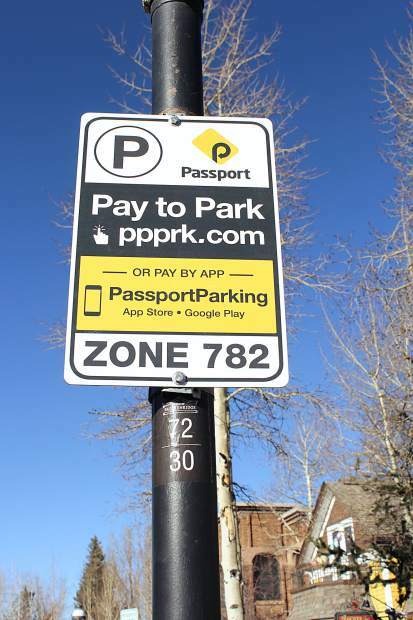 Signs tell users what zones they are in for the ParkingPassport Mobile app. As part of a long-term project to reduce traffic congestion in town, Breckenridge will begin a paid parking program on Dec. 1. For the past two years, the town has used a parking and transportation task force to look at the various traffic issues, in addition to hiring traffic consulting firm NelsonNygaard. Although the town had talked about building a parking garage at the F Lot, NelsonNygaard said that this could only worsen traffic. From there the town began to take smaller steps toward lessening their traffic woes. Roundabouts and a trolley system were put into place, and walkability was improved. But the next step from the town is one that has been received with less than favorable input from locals: paid parking. “Like any issue, change is difficult for people. However, once we explain the reasons for paid parking and the parking pricing, the reactions have generally been one of understanding,” said Kim Dykstra, the director of communications for the town. The town has embraced the fact that paid parking will not be a popular decision. Ads in the Summit Daily, as well as on the town Facebook page, show a man splattered with snowballs with a line saying “we’re not expecting confetti.” The town created a new campaign around paid parking called Breck Forward. The website compiles information useful for locals and visitors, such as where the paid parking is and how to use it. It also has information on some of the other components in the town’s plan to mitigate traffic. Zipcar, a car sharing company, will be bringing in cars that will be available for rent starting Dec. 1. This will be Zipcar’s first entry into a mountain resort, Dykstra said. There will be a ribbon cutting at the Blue River Plaza Dec. 1 at 10 a.m. for the company. The campaign has also included videos. One video features town Mayor Eric Mamula telling people about the technology aspect of the new parking. The kiosks are solar powered, and people can either pay for parking through the kiosk, or through the PassportParking Mobile Pay app. A newer video features town council member Jeffrey Bergeron showing exactly how to use the new parking. Under the new system, parking will be free for the first 15 minutes; then it’s 50 cents for the first hour after that. For Monday through Thursday, the first additional hour ranges from 50 cents to $1 depending on where the car is parked. The third hour and beyond on Main Street bumps up to $3 because the town is trying to prevent people from parking there all day. There is a different rate for weekends, holidays and special events. The town is offering a merchant validation program. The program allows businesses to validate customer parking through the app. The town has included a tutorial on the site to help get businesses started. They will also do a webinar on Nov. 29. The roll-out of the new system hasn’t been without its hiccups. At the town council meeting on Nov. 22 Police Chief Dennis McLaughlin reported that one of the solar panels on a kiosk had already been damaged. During the meeting the council also did a first reading on an ordinance updating town code that would allow the town to enforce new parking laws. The first reading was passed by all town council members, except Mike Dudick and Mark Burke, who were absent. The town will continue to hold pop-up meetings to help the town transition into paid parking. People unable to attend these meetings can also stop by the Breckenridge Police Station during office hours or schedule a demo with Sergeant Lyn Herford.